Nelson County was founded in the spring of 1883 at the territorial legislature in Grand Forks. It was formed from portions of Grand Forks, Ramsey, and Foster counties. The name Nelson County was named after the Honorable N.E. Nelson, customs agent at Pembina and also a member of the ND legislature. 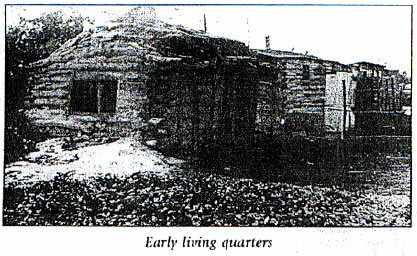 He recorded the first homestead in Nelson County. With rumors that the railroad would be built from Aneta to Devils Lake, a man named David Newton Tallman became an important person to Tolna. He was born January 22, 1872 in Millbrook, N.Y. and raised there. David graduated from Union College, Schenectady, N.Y. and came to Willmar, Minn. in 1893. He married Clara Larson in 1894 and they had five daughters. Mr. Tallman was employed with the Great Northern Railroad and later had a position in a local bank. Tallman organized the Dakota Development Co., which developed town sites along the Great Northern Railroad in North Dakota. His association with James J. Hill, Empire railroad builder, led to large interests in banks that were created in the towns. 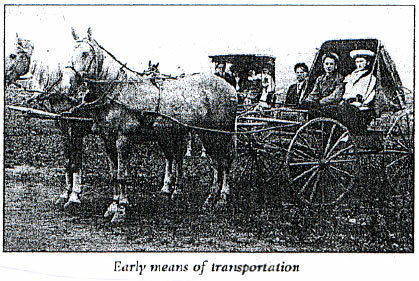 The Tallman Invest Co. of which he was president and treasurer was formed and a large number of banks were established in North Dakota, Minnesota, and Montana to assist in placing farm loans. One of the towns of special interest to Mr. Tallman was Tolna. This name was a coined form of ‘Tallman’ who platted the town. Unique to Tolna is that Mr. Tallman named its streets after his daughters; Helen, Esther, Gertrude, Margaret, and Marjorie. 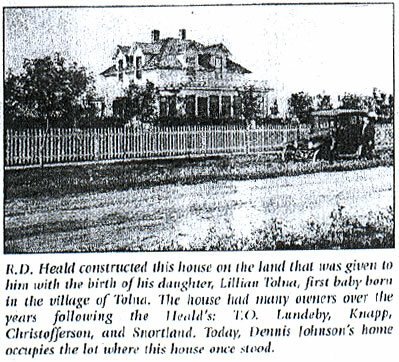 He also owned the quarter section of land the town of Tolna was built on. The quarter section of land the town was built on is Sections 10 & 11, Township 150, Range 61, Nelson County. On May 8th, 1906, the town was surveyed. On May 25, 1906 the town site was open for sale, and the building of the town began. It was stipulated that the first baby born in the town would be given free land for a house. That baby was a girl, born September 26,1906 to Mr. and Mr. R.D. Heald. She was named Lillian Tolna Heald. In 1906, the Great Northern Railroad built a secondary line from Aneta to Devils Lake, which came through Tolna. 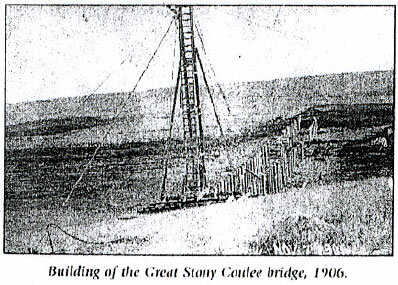 It was necessary to construct a bridge across the Great Stony Coulee east of town. 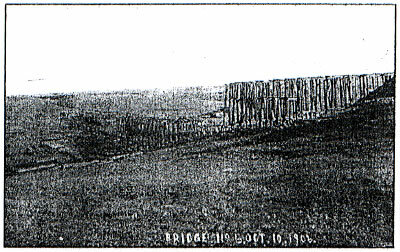 This great bridge when finished was 1,054 feet from span to span and about 8 feet above the lower part of Stony Coulee. The Great Northern Railroad Company bought 30 acres of land in the coulee for a water reservoir. 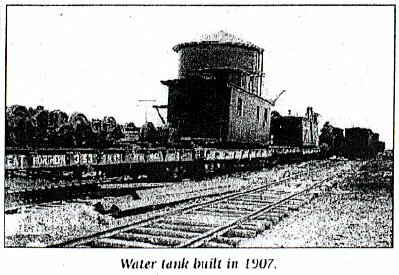 In 1907, the tank crew built the water tank and laid the pipes to the reservoir for the railroad. 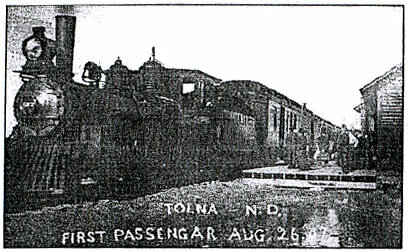 The first train came through Tolna August 29, 1907. Mr. A.A. Kobe was the first depot agent. In October, 1907, James J. Hill, President of the Great Northern Railroad Company passed through Tolna on a special train going west. Tolna received its first mail by train October 14, 1907. Past history shows that our ancestors served on many church, social, and government organizations. They contributed for the betterment of their family, friends, and neighbors. Today we continue to better the organizations that the root of our forefathers established, for many of the same reasons they had, to better our lives.